← My book has a name! ..and I really, really would love to taste this! Charlotte – and this year you really must! That is something I would love to taste. Dear… Better, you would have mentioned his( seller ) phoneno. too to fecilitate in locating him. @ Sangeeta – thanks – it’s been way too long! @ Nina – I hadn’t heard of “Doodh ka Puff’ – how do you make it? 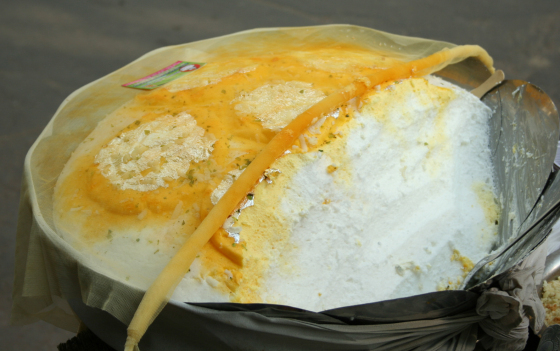 @ Uma – you can’t really miss the Daulat ki Chaat guys during the winter! The Parsi recipe from Bapsi Nariman’s Gourmet’s Handbook Of Parsi Cuisine. :Doodh na Puff (Beaten Frothy Milk) is a Parsi delicacy only made in colder climates when the night temperatures are below 20 C.
Boil the milk and sugar together. Simmer until it is reduced to three qurters. Cool. Add the rest of the ingredients. Place the dekchi exposed to the sky at night, covered with a mul cloth. In the early morning beat the milk with a beater. Keep removing the froth, filling it in glasses. Serve before the sun comes up. @Nina – thank you so much for posting the recipe. From what I saw of the Kumars making Daulat ki Chaat, the Parsi version is a bit different. 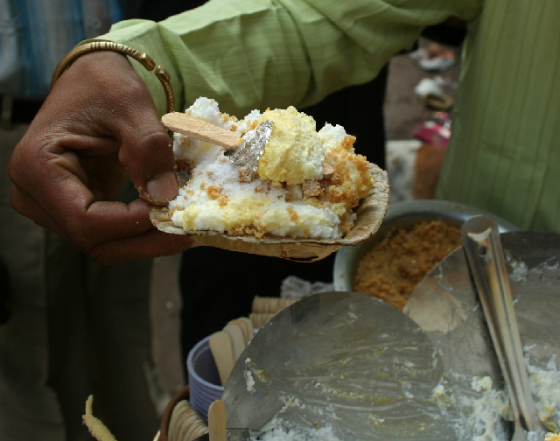 In Daulat ki Chaat the milk isn’t thickened but it has cream in it. Doodh na Puff also seems to have a lot more sugar in. I’ll be trying Doodh na Puff just for the name alone! Can’t wait to get my hands on your book. I like the title! hey Pamela, good to know you are back. will you be hosting any uperwali chai events. Sounds amazing, when are we going to taste it? 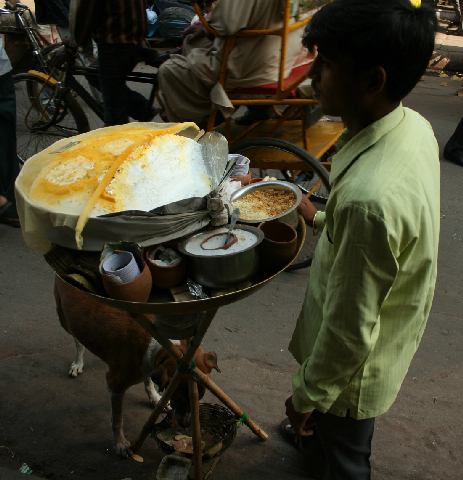 Risham – you have to come to Old Delhi to taste Daulat ki Chaat! I learned about this desert while reading a vir sanghvi article 6 years ago (which he did for the TLC benares session), but he called it malaio. i don’t know it was the feeling of amazement and rarity surrounding this delicacy in the article, or complete ignorance of my benarasi roommate about existence of any such desert in his own town, that made me to believe it was an extremely endemic phenomenon of mystic benares. Years passed by i moved to pondy but memory lingered on, and sometimes manifested itself in short google researches. And years later i find myself in middle of chawri bazaar trying to find medical textbooks at bargain rates and i stumble upon a handcart parked by the busy street. I had a small donga (disposable bowl) of it, is it whipped cream? Too light for that. But the totally north Indian style toppings and presentation made me think it can’t be a european dish, there was nothing european about the setting, and then my mind made the connection of that 7 years old memory foamy but Indian- it’s got to be malaiyo. To confirm i asked the vendor who turned out to be the owner/chef of the bussiness too, where are you from? Ofcourse the answer was U.P. old Delhi saved me a trip to benares. But still the name was a mystery – because it meant a snack of wealth and not snack for wealthy. And i do not know if the vendor was lying or was telling the truth – but the name comes from the first name of his great great great uncle Mr. Doulat. The first u.p wallah to introduce it to the old Delhi. the method described by the vendor was tedious sheer hard work, which made me feel sorry for these guys. I was wondering if someone can develop some malaio-makers and make lives of these guys way more easier. i asked for his contact number, he gave me a visiting card instead. And I’ll soon witness the whole process first hand. i work for Weber Shandwick, a global PR agency. We wanted to touch base with you for one of our clients. Request you to share your contact details with us and also confirm your current location, if possible.